The ever growing number of Polish shops and businesses in the Wigan area. 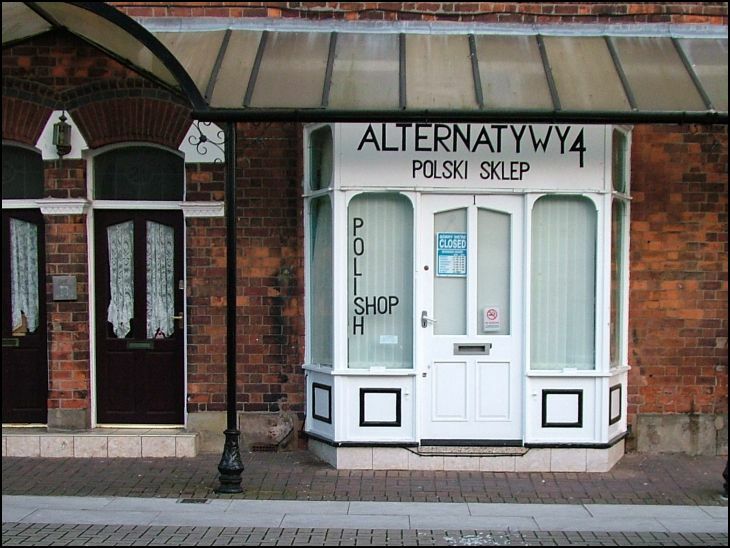 This is the Alternatywy4 Polski Sklep a few doors up from Mabs Cross School. What do they sell Brian. Is it a Polish food outlet? Interestting! What do they sell? I am a Wiganer, left for the USA 32 years ago. All of these years I have missed Wigan, now though, I am beginning to wonder if I would even recognize it if I were to come back. Wigan will always be home, it is sad though to see it change so much and in my opinion, not for the better. I'll try anything once, might be worth a look and see what delicacies they stock.I got to admit I do miss German foods since moving back to Wigan, so maybe polish can tempty me.......How the piggin hell do you pronounce the shop name though?! Hey Janet..Things have changed for the better in Wigan.Not many clogs and shawls now,But a vibrant modern town and we are glad to see the changes! Polish beer in all the supermarkets and most pubs now - great stuff as well! I'm all for Wigan becoming a more multi cultural town. Budweiser originates from Czechoslovakia (well, it's next to Poland!) and it's far nicer tasting than the American 'copy'. It's not 'Tsikie', but 'Tyskie'.